I have made this tart many times with all manner of ingredients for the filling, so feel free to use any seasonal vegetables you’re particularly excited about. The millet in the crust gives it an addictive crunch and while the ingredient list definitely doesn’t shy away from the butter, I feel slightly more virtuous since it relies on whole grain flour, millet and cornmeal. The crust is incredibly forgiving: I’ve made it with spelt flour and whole wheat pastry flour and it turned out fantastic with both, so feel free to play around here as well. 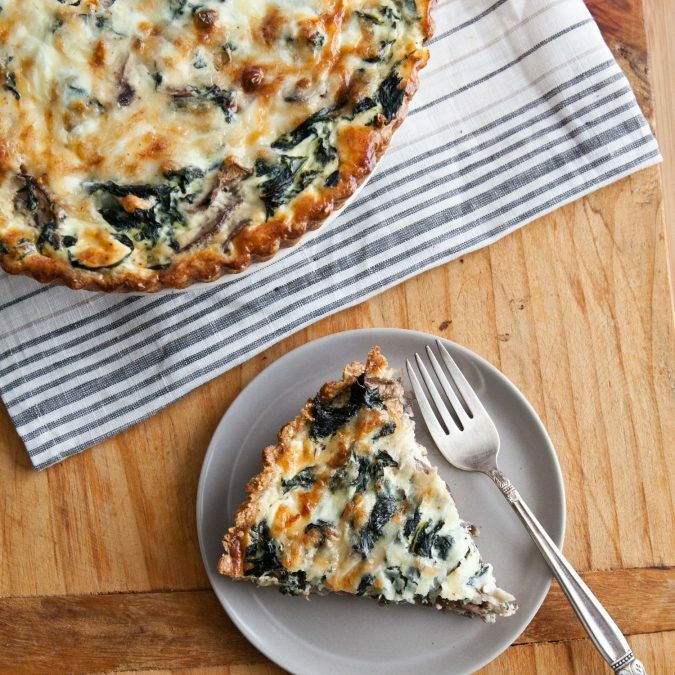 The tart reheats beautifully in the oven (I avoid the microwave because I like the crust to stay crisp), and feels just fancy enough to serve to guests although we love to have it for dinner with a simple salad and enjoy the leftovers for a few days after that. Prepare the Crust: Butter a 10 x 1 inch tart pan with a removable bottom. Using a food processor, pulse together the cornmeal, flour and salt. Add the cubes of butter and pulse until mixture resembles coarse meal (alternatively, you can use a pastry blender or your fingertips to work the butter into the dry ingredients). Add ice water and pulse until the dough starts to look like wet stand. Test to see if it’s done by gently squeezing a small piece between your fingers: you’re looking for it to hold together and not crumble away. If it seems too crumbly, add more water, 1 teaspoon at a time. Turn the dough out into a large bowl and mix in the millet using a fork. Press the dough evenly into the bottom and up the sides of the prepared pan. Chill in the refrigerator for at least 1 hour and up to 1 day. Prepare the Filling: Preheat the oven to 375F. Bring a large pot of salted water to a boil and add the kale. Cook until just softened, about 1-2 minutes. Use a slotted spoon and transfer to a large bowl of ice water to stop the kale from cooking. Remove from the cool water and, using your hands, squeeze as much water from the leaves as possible, laying the greens out on clean work surface. They tend to clump into a ball when squeezed, so spend a few moments “de-clumping” and separating them. In a medium sauté pan over medium heat, warm the olive oil and sauté the shallots until tender, about 3 minutes. Add in the garlic and sauté for an additional 30 seconds. Add the mushrooms, thyme and a generous pinch of salt and cook down until tender and fragrant, 5-7 minutes. In a medium bowl, whisk together the milk, sour cream, eggs, salt and pepper. Fold in the grated cheddar cheese. Place the prepared crust on a small baking sheet for easy transport to and from the oven. Leaving behind any cooking liquid from the pan (I use a slotted spoon here), spoon the mushroom mixture on top of the crust followed by the kale (arrange in an even layer). Pour the custard mixture on top of the kale. Bake for 40-45 minutes or until the top is golden brown and the filling is completely set. Let cool for 15-20 minutes, unmold the tart and serve warm or room temperature. Refrigerate, covered, any leftovers for up to 3-4 days.